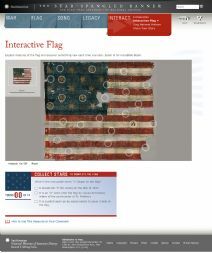 Explore features of the Star-Spangled Banner using this interactive flag included in the online exhibition entitled The Star-Spangled Banner: The Flag that Inspired the National Anthem. Using this interactive tool, students can click on hotspots and learn something new about the flag each time they click. They can also zoom in on the image of the flag in order to see incredible detail. 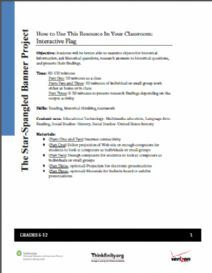 4D: The student understands events that celebrate and exemplify fundamental values and principles of American democracy. 4E: The student understands national symbols through which American values and principles are expressed. Blue wool uniform coat, gold-colored buttons on jacket front and sleeves.